Diana Listmaker around AS II. Countess Diana Listmaker, OP, OL, is a founding member of the SCA. 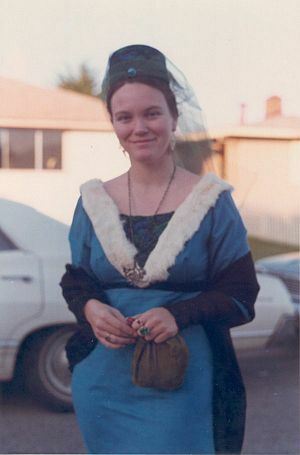 At twelve noon Diana and three others were standing around in costume, one of Diana’s roommates was still sewing on hers, and Diana was wondering what to do with four people in costume, other than admiring the outfits. Then it was 2:30pm and there were people in medieval costume all over her yard. (Thus the precedent was set for Official Society Time: about two hours late.) Dr. Elizabeth Pope, head of the Mills College English Department, was the Official Judge. The Second Judge and official archbishop was Jon Studebaker, under the name of Sir Jon de Cles. These two judges would determine the winners of each fight on a modified fencing basis, where one counted a “killing” blow instead of a touch. They sat on red covered thrones in front of a purple hanging. Beside them, on a purple cushion, rested the crown, to be awarded to the Champion’s lady (there were no kings at this time). A triumphal march was heard (the Processional from the Play of Herod - 13th Century) and around the corner came a procession of knights and ladies. Two by two they came forward, bowing to the judges and parting to circle round and join again. As they came up they were announced. There were Astrid Anderson (Countess Astrid of Hawk Ridge) as Queen Lucy of Narnia, in a red dress with a bird on her arm, and her knight, David Bradley as David the Herald (Sir Ardral Argo verKaeysc), Ken de Maiffe as Sir Kenneth (Duke Fulk de Wyvern) with his lady Mary (Duchess Mary of Tamar) who was wearing a flowing leopard print, with high dressed hair and a monkey, and was something which Sir Kenneth had found while on the Crusades. 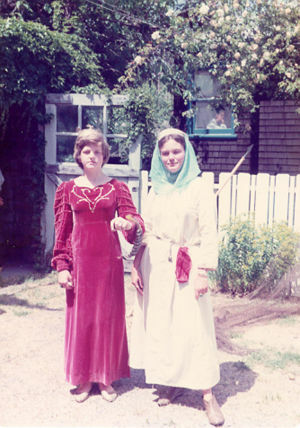 Diana’s roommate, Molly Titcomb (Mariana Silversea), wore turquoise satin, with Suzanne as a princess in blue and Benjy, in a russet cloak, as a hobbit. Jerry Jacks (Israel ben Jacob) was Lord Mediocrates of Hellas, Richard Barnhart (Sir Aegineous, aka Duke Richard the Short, later Richard of Mont Real) was Sir Aeginius, Frederick Hollander was Sir Frederick of Holland (Duke Frederick of Holland), Steve Henderson (Sir Steven MacEanruig) was Sir Henderson, Henrik Olsgaard (Duke Henrik of Havn) was Sir Henrik the Dane, Paul Wolfgangel, a graduate from Cal in linguistics, from Germany, was Sir Deutsche Bursenschaft, Marion Breen (Mistress Elfrida of Greenwalls) was Dona Ximena (wife of El Cid) while Walter Breen (Walter of Greenwalls) was a “hairy hermit wild,” or friar of the Chaucerian sort, complete with wineskin. Also present were Nathan Retarius (who fought with net and trident), Edwin Bersark, Beverly Hodghead and Ellen Hodghead with David Hodghead (David of Ilwheirlane) and Marynel Hodghead (Duchess Marynel of Darkhaven). After all had been announced there was the long note of a horn, and David the Herald announced the blessings of the swords. At this the archbishop, Jon de Cles, rose and let the sonorous Latin roll forth, “Ecce Eduardus ursus scalis nunc tump-tump-tump occipite gradus pulsante, post Christophorum Robinum descendens ...”, and the assembly chorused “Amen.” The first combat was announced between Sir Siegfried von Hoflichskeit and Sir Kenneth, with mace, and then Sir Aeginius versus Nathan the Retarius (with net and trident). There was a pause as singers sang “Sumer is i-cumen in” and then two more combats followed by four dancers doing a pavanne. Then combat resumed. As the other fighters were all styled as knights, and as David the Herald was fighting well, Sir Siegfried von Hoflichskeit, with the consent of the rest of the fighters, called David forth to kneel and, in the manner of the medieval order of chivalry, dubbed him knight. This was the first knighting in the Society, giving David (now Ardral Argo verKaeysc) the title of First Knight. The strength of the shields that Siegfried and Fulk had made was proven when the father of one of the singers (Beverley Hodghead) left and returned with crossbow and long bow. An arrow from the longbow merely chipped paint off the shield, leaving the broad arrowhead curled up from the impact . The finalists were Sir Aeginius and Sir Deutsche Bursenschaft. 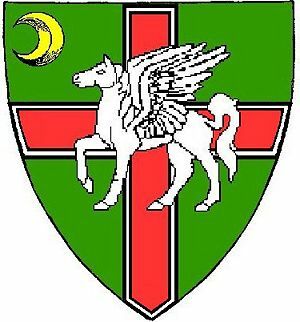 Sir Aeginius was fighting with spear and shield. Sir Deutsche Bursenschaft was wearing a fencer’s outfit with fencing mask and using a wooden lathe sword in the fencing manner. Sir Aeginius dealt a blow which broke the sword and mashed the hand holding it, causing Sir Deutsche to fight with one hand behind his back and a mace in the other. Sir Aeginius thrust with his spear and Sir Deutsche Bursenschaft dodged, they circled, Sir Deutsche caught Sir Aeginius between the neck and shoulder, thereby “killing” him and winning the first lists. He placed the crown on the head of his lady, a “simple peasant maid.” Marynel of Darkhaven filmed the tourney with her movie camera. Subsequently Sir Deutsche Bursenschaft returned to Germany and was never heard from again. The participants so enjoyed themselves that they decided to do it again at Midsummer’s Day. After the tourney twenty-four of the participants formed into another procession and processed all the way up Telegraph Avenue to the campus and back again, protesting the Twentieth Century. About a dozen people stayed, procured some food, built a fire, and sat around eating roast chicken and singing and dancing in the firelight. And thus the first revel occurred, with the revelers staying past midnight reliving the bright moments, singing, drinking wine, and enjoying the fire. Some time later, When Marynel’s films were developed, it was discovered that Sir Aeginius, now Sir Richard the Short, had struck a killing blow that the judges had missed. Richard was declared the true winner and Marynel of Darkhaven was deemed his lady and Queen of the day. Astrid of Hawk Ridge and Diana Listmaker at the First Tourney. This page was last modified on 20 August 2010, at 22:36.